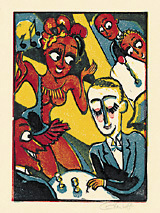 Untitled (Cabaret) - - c.1920s, Color Linocut. Edition 3. Signed in pencil, lower right. Image size 10 1/16 x 7 inches (256 x 178 mm); sheet size 12 1/4 x 8 5/8 inches (311 x 219 mm). A fine painterly impression, with strong, fresh colors, on cream laid Japan; full margins (5/8 to 1 1/8 inch), in excellent condition. Scarce. 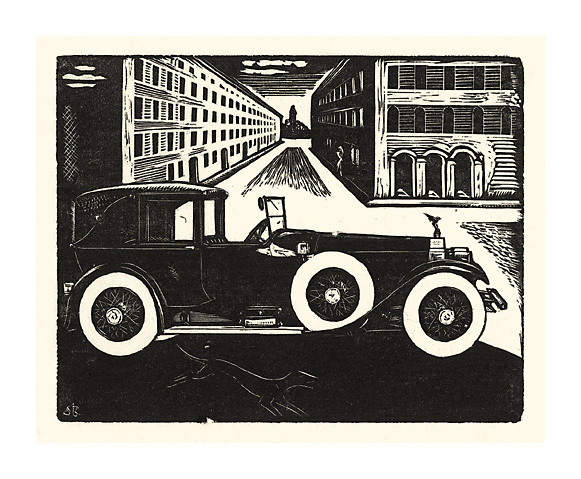 Untitled (Town Car) - - c.1920-30s, Linocut. Edition 2. Signed in pencil, lower left, verso. Image size 5 x 6 1/2 inches (127 x 165 mm); sheet size 6 3/16 x 8 inches (157 x 203 mm). 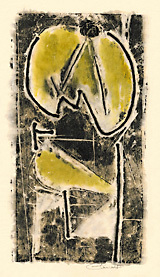 A fine impression, on cream laid Japan, with full margins (1/2 to 7/8 inch), in excellent condition. Scarce. 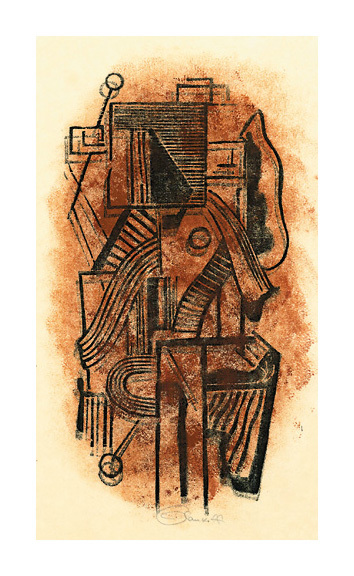 Untitled (Abstraction in Black and Sepia) - - c.1940-50s, Color Linocut. Edition 7. Signed in pencil, lower right. Image size 10 1/4 x 5 3/4 inches (260 x 146 mm); sheet size12 1/4 x 6 1/8 inches (311 x 156 mm). A superb, painterly impression, on cream laid Japan, with full margins (1/8 to 1 1/8 inches), in excellent condition. 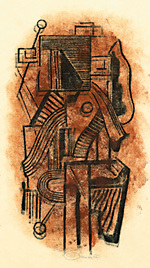 Printed in oil based (black) and red oxide water soluble printer's ink. Scarce. 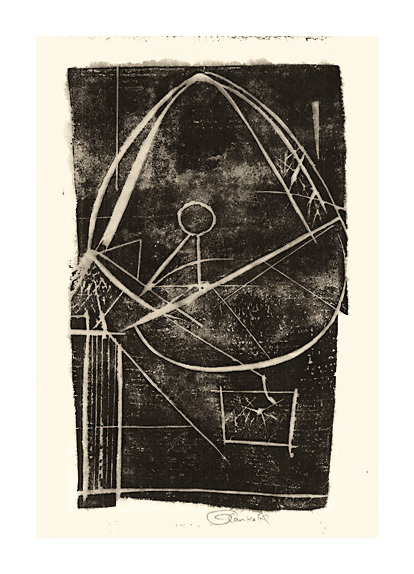 Untitled (Abstraction in Black and White) - - c.1940-60s, Linocut. 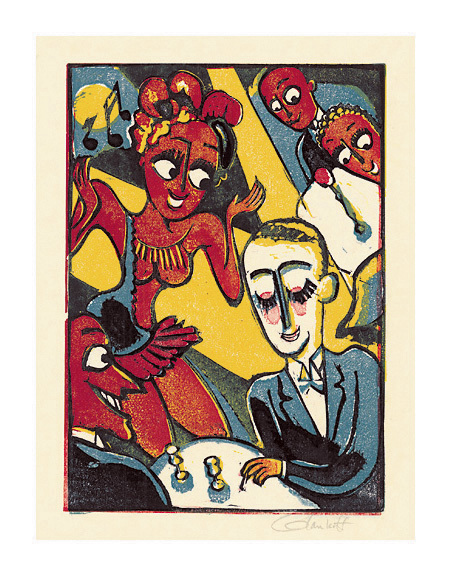 Edition 9. Signed in pencil, lower right. Image size 8 7/8 x 5 1/2 inches (225 x 140 mm); sheet size 12 3/4 x 8 5/8 inches (324 x 219 mm). A superb, painterly impression, on cream laid Japan, with full margins (1 3/8 to 2 inches), in excellent condition. 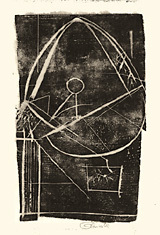 Printed in water soluble printer's ink. Scarce. 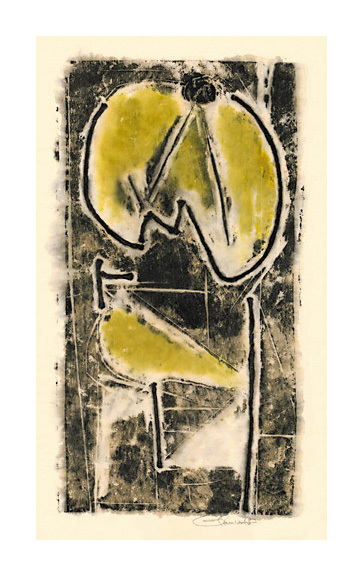 Untitled (Abstraction in Black and Yellow) - - c.1950-60s, Color Linocut. Edition small. Signed in pencil, lower right. 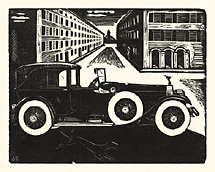 Image size 15 1/8 x 7 1/2 inches (384 x 191 mm); sheet size 18 5/8 x 11 1/4 inches (473 x 286 mm). A superb, painterly impression, on cream laid Japan, with full margins (1 1/2 to 2 inches), in excellent condition. Printed in water soluble printer's ink. Scarce.